President Moon Jae-in will be accompanied by 64 government, social and business representatives on his trip to Pyongyang, Cheong Wa Dae chief of staff Im Jong-seok said Sunday. Moon is set for a three-day visit to Pyongyang from Tuesday, upon which he will hold his third summit with North Korean leader Kim Jong-un. The 14 government and Cheong Wa Dae officials include National Intelligence Service Director Suh Hoon, National Security Office chief Chung Eui-yong and the ministers of defense, foreign affairs and unification. The ministers of transport and maritime affairs and the chief of the Korea Forestry Service will also accompany the president. From the National Assembly, Reps. Lee Hae-chan, Chung Dong-young and Lee Jeong-mi, respectively the chiefs of the Democratic Party of Korea, Party for Democracy and Peace and Justice Party, will also accompany Moon. 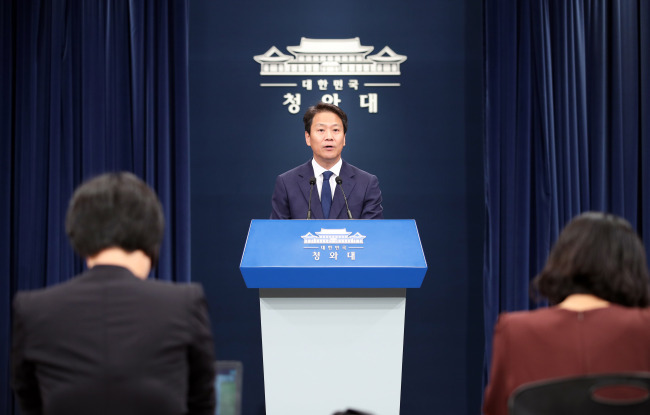 The leaders of the main opposition Liberty Korea Party and minor conservative Bareunmirae Party declined Cheong Wa Dae’s invitation to join the president. Seoul Mayor Park Won-soon will be included in the retinue as chief of the local government association, and Gangwon Province Gov. Choi Moon-soon has been included to represent the border regions, Cheong Wa Dae said. The 52-member special retinue includes individuals representing business, social, cultural and religious circles. Businesspeople heading north include SK Group Chairman Chey Tae-won, Samsung Vice Chairman Lee Jae-yong, LG Group Chairman Koo Gwang-mo and Vice Chairman of Hyundai Motor Group Kim Yong-hwan. Hyun Jeong-eun of Hyundai Group, which has conducted a diverse range of inter-Korean business projects, and Shin Han-yong, chairman of the Corporate Association of Kaesong Industrial Complex, are also to be included. Others on the list include Kim Hong-gul, chair of the Korean Council for Reconciliation and Cooperation as well as son of late President Kim Dae-jung, and high-level officials from various religions. According to Im, members of the special retinue will meet with North Korea’s ceremonial head of state Kim Yong-nam, and the South Korean businesspeople are scheduled to meet the North’s economy officials. Earlier in the day, South Korea’s advance team left for Pyongyang by bus to make the final arrangements for Moon’s visit. The advance team, consisting of 93 government officials, technology-related staff and reporters, is led by Suh Ho, presidential secretary for unification policy. The third summit comes at a time when US-North Korea dialogue on denuclearization has run aground, the resolution of which Moon sees as a major goal of his visit. At a meeting with senior advisers to the summit preparation committee on Thursday, Moon said Seoul’s role is to help Pyongyang and Washington revive denuclearization talks. “Our role is to find the middle ground, revive the talks to bring about denuclearization and to bring corresponding measures,” Moon said at the meeting.